Keurig K45 vs K55: Which One’s Best? Keurig’s K45 and K55 are both low-end, entry-level Keurig coffee makers. Both are affordable and intended for nothing more complicated than to brew coffee quickly. Both are compatible with every K-cup pod on the market, which gives users of both access to dozens of different brands and hundreds of flavors. Both also come with reputations that they stop working for no apparent reason, however. Because it’s a little lower-priced and easier to maintain, we give our nod to the K55. Both machines brew coffee quickly. Both offer a wide variety of coffee flavors and are simple to operate. Users love both for all these reasons. Both machines are mostly just stripped of pricey bells and whistles. So, on performance, it’s a wash. The K55 retails at a lower price than the K45. It’s not a lot more complicated than that. Both are built primarily of plastic, and both have reputations for inexplicably not working. However, the K45 is a little bit more of a headache to clean and maintain, so we have to give the nod to the K55 here. Both have roughly the same design. Both are compatible with every K-cup pod, and both have removable 48-ounce water reservoirs. The K45 is harder to clean and requires more work to maintain. Again, based on that, the nod goes to the K55. The K45 brews coffee, brews it quickly, and brews it with push-button simplicity. It’s intended to be a first-thing-in-the-morning brewing system in the home. It doesn’t come with a lot of bells and whistles and requires extra work to maintain optimum effectiveness. 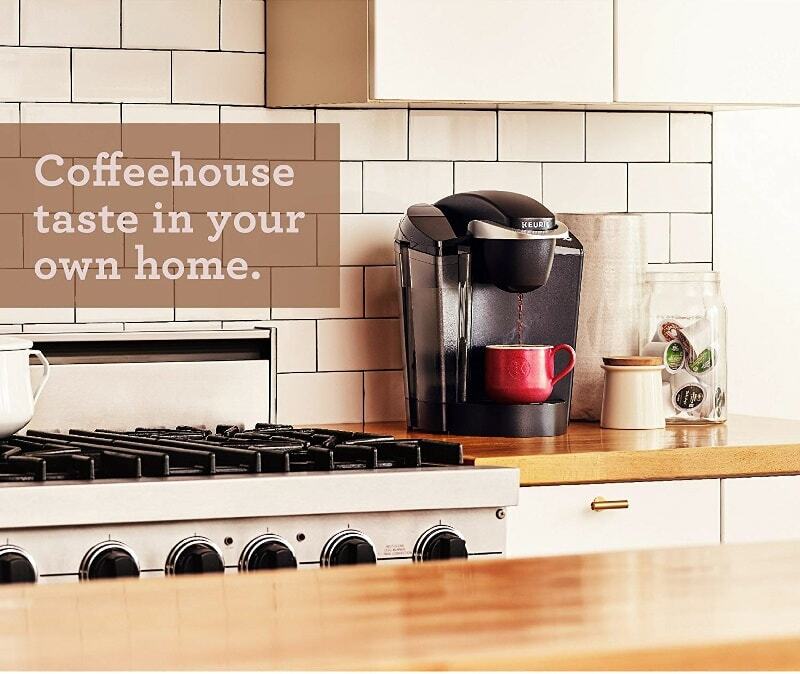 All the Keurig does is brew coffee. It’s an uncomplicated machine that will even turn itself off, so the hardest thinking required is choosing which of the many hundreds of flavors to brew. But it does come with lingering issues of durability. Unless you go to the expense of buying two models of the same machine, a strict side-by-side comparison is difficult. Instead, you have to get a sense of how people have related to the individual models they purchased. Rather than checking the reviews of just one model, you have to go through the reviews of two. You want a comprehensive look at people’s experiences with both coffee makers, but you don’t want to spend hours reading reviews, many of which are written by people who are lucky if they can find their way out of a paper sack. We went ahead and read those reviews for you, and have summarized their findings to save you valuable time. As barebones, push-button coffee makers, users really liked both models. We’ll get into the gripes here shortly, but they shouldn’t be interpreted to mean that one or both of these machines are bad. Users of both really liked that they were uncomplicated, brewed quickly, and offered a wide variety of flavors from a wide variety of roasters. 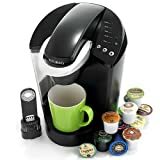 Both models are pretty affordable as Keurigs go. People also liked that both had a removable 48-ounce reservoir that is compatible with a filter to improve water quality. That speed and simplicity comes with a price, however, and that is noise. They are fast, they are simple, and they are both noisy. Both models also come with lingering questions about durability. The primary complaint that users had about both was that they just simply stopped working. Sometimes it was after a couple of years. Some lasted a few months. Some brewed three cups and brewed not one more. The percentage of users who reported this is still pretty small — around 10 percent for both — but it’s more than what you’d expect from other product lines. They’re both made of plastic, which says something. For the K45, this was coupled with complaints that it is difficult to clean and maintain. Some users felt the reliability issues were at least in part related to the fact that they need constant attention. The K55, on the other hand, is much simpler to clean and maintain, judging on what users have to say about it. The general consensus opinion is that both coffee makers are simple, fast, and brew good coffee. They are versatile enough to offer hundreds of different flavors of coffee, tea, and hot chocolate. Both are entry-level Keurigs that put whatever size cup of coffee you want into your hands in less than a minute. We picked the K55 over the K45 for pretty basic reasons. Both models were designed pretty similarly, and both delivered good coffee at the press of a button. Both have reputations for being unreliable, but the K55 is a little easier to keep running. It’s also a little lower-priced, so you get a bit more for a bit less. It’s as uncomplicated as operating one of these machines in the morning. If you just want a cup of coffee first thing in the morning to get you going, both of these machines would serve you well. That is, as long as you don’t get one of the lemons. Cold Brew vs Iced Coffee: What’s the Difference? Manual vs Electric Coffee Grinders: Which is Right for You? Keurig K15 vs K55: Which One’s Best? Keurig K55 vs K50: Which One’s Best?